Native to northern Europe, oats are cultivated worldwide as a cereal crop. Both oatmeal and oatbran are readily available and used in savoury dishes, oatmeal, or added to breakfast cereals. Oats, like the whole plant, are restorative for the nervous system, and can help to reduce blood cholesterol levels. Traditionally the green, newly harvested whole plant was used medicinally. Oats seed is a gentle nervine tonic for treating exhaustion, sleepiness, adrenal burnout, or addiction to nicotine, caffeine or other drugs. The herb is also a serviceable diuretic. This should ideally be made from the fresh green whole plant. Take 20 drops–1 tsp (1–5ml) 3 times daily for nervous exhaustion, tension, anxiety, debility following illness, or depression. It combines well with vervain, wood betony, or valerian. 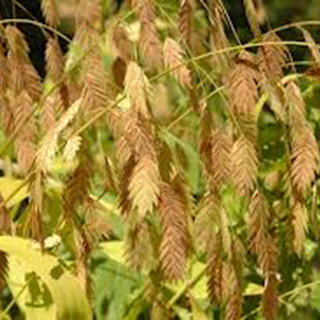 Drink 1 cup (2 tsp herb per cup of boiling water) of oatstraw as required as a restorative for the nervous system. For dull, greasy skin or a tendency for acne, mix 1/2 cup of fine oatmeal with water to make a paste. Apply to the face and leave for 10 minutes before rinsing. Strain 1 pint (600ml) of a standard decoction of the oatstraw or whole grains into the bath to ease itching and eczema. Prefers neutral or slightly acidic soil and cool, damp conditions, but will tolerate dry spells. Winter oats are sown in autumn for a late summer harvest, or in spring as an early autumn crop. Harvest in late summer or early autumn as the grains turn to pale cream.